Stop me if you've heard this one. A guy is in need of a haircut. New to town, he doesn't know what barber to visit. There are just two barbers in town. The first one he visits has a messy shop. There's hair all over the floor. There are dirty towels and cloths visible in the back. The barber himself has the worst haircut the guy has ever seen. He quickly exits the shop, mumbling on his way out. Walking into the other barber shop, the guy is amazed at how pristine the place is. The floors are spotless. Everything is neatly put away. The mirrors are clean. And the barber has an excellent haircut. What's the guy do? Does he go get his hair cut by Barber #1 or Barber #2. If you picked Barber #2, you're wrong. He goes to Barber #1. With only two barbers in town, it's obvious -- for the sake of the riddle -- that each barber has his hair cut by the other barber. Since Barber #2 sports a stunningly wonderful haircut, Barber #1 is the one to choose. I saw this ad in the local newspaper the other day. 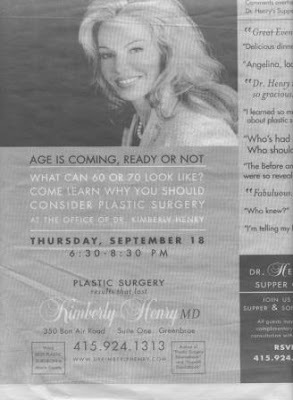 My first reaction when I saw the ad was, "Damn, can't they find a better example of a plastic surgery patient to use?" Then I realized it must be a photo of the surgeon herself. So my next thought was, "Damn, no one wants to look that artificial, do they?" And how about the lines, "What can 60 or 70 look like? Come learn why you should consider plastic surgery." Kind of implies that person is, in fact, 60 or 70. Yeah, right. Want to see what you'd really look like at 60 with a lot of plastic surgery? Watch out. She's scary, that Priscilla Presley. When did it become so wrong to age? It's scary the way the Priscilla Presley's and Wayne Newton's of the world look. Priscilla IS scary! Elvis would be scared to see her today!